We offer quality Ceramic Band Heaters, which are widely used in blow molding, injection molding, film extruders and all plastic & rubber processing machinery. These are available in SS sheathing with power saving options premiums per the requirements of our client. Further, our heaters offer efficient heat transfer even on irregular surfaces in comparison to mica band. PHP’s Ceramic Band Heaters are designed and manufactured with more than 40 years of practical experience, for superior performance and life expectancy. 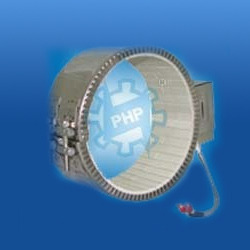 As a manufacturer specialized in industrial electric heating elements & the desire to provide quality products and services to our customers both OEM’s & End Users, PHP specializes in designing Ceramic Band Heaters, Mica Band Heaters, Nozzle Heaters & Strip Heaters to your exact specifications. Available in Chrome Nickel Steel with Power Saving Options. Special High Grade Steatite Insulators for Superior Thermal Conductivity. Power saving up to 30%. 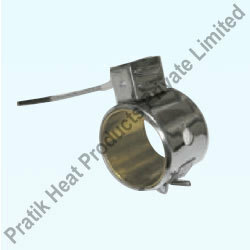 Designed for Higher Temperature up to 500°C. Robust Terminal Junction with Specially Designed Protection Cap. Efficient Heat Transfer even on irregular surfaces in comparison to Mica Band. Conserves Energy with Improved Heating Efficiency up to 55 Watts per square inch. Engineered for Longer life with Superior quality Nichrome wire for Uniform Temperature & Maximum Amperage carrying capacity. Reduces Down time for replacements. Available in various Lead Terminations & Clampings expandable to fit around the Barrel O.D. 500 mm long Insulated Metal Braided Flexible Leads. Barrel Nut Type clamping with Terminal Protection Box. Also available in two piece construction. Suggested Watt Density 40 to 45 Watts / Sq Inch. Allen Key Barrel Nut Type clamping with Terminal Protection Box. Total Wall thickness: 25 mm. Suggested Watt Density 50 to 55 Watts / Sq Inch. Chrome Nickel Steel Sheathed with Heat Optimizing Insulated Cover. Power saving Insulated Outer Cover. 500 mm Glass Fiber insulated. Terminal Protection Cap, unless specified. Looking for Ceramic Band Heaters ?